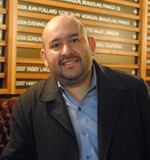 As Wine Director for Mina Wine Group, sommelier Rajat Parr oversees the wine programs for some of the country's most popular and influential restaurants, including Seattle's own RN74. His resumé also includes a James Beard award winning book (Secrets of the Sommeliers, written in collaboration with Jordan Mackay), a degree from the Culinary Institute of America, and winery called Sandhi Wines. All this before the age of 40. Suffice to say if sommeliers can indeed be stars - and they can - Parr's shines quite brightly. Below I talk with Parr about RN74, how he works to make wine less intimidating, and what he thinks of Washington wine. The wine culture in the U.S. is obviously evolving, with the U.S. now the world’s largest consumer of wine. What do you see as the biggest change taking place in wine right now at a consumer level here? I think the Millennials, that’s the generation that everyone should be focused on. The Baby Boomers are pretty happy with what they have. They might not have a lot of extra cash sitting around to explore, whereas Generation X and Y are experimental but still more conservative. Millennials, no one knows where they are going to go yet, and they are still forming a point of view about their experiences and are very receptive to new information. Both of our RN74 restaurants, that’s the base of our clienteles, Millennials. Of course we want people from all ages to come but you want the energy where young people would come and not feel overwhelmed by wine. I know plenty of people who are in their twenties and have plenty of money and they don’t want to go in to some fancy restaurant feel like someone is looking down on them and saying, ‘Oh, what do you want today?’ They want somewhere casual where they can come in and sit down and order a $30 bottle of wine or a $1000 bottle of wine. It doesn’t really matter, but they have to feel comfortable. That’s the future of the restaurant industry. The exceptions, New York City still holds to its formal service but I think the rest of the country is all very casual now. Talk to me about RN74 and – obviously there is a Burgundy focus here – but how you’ve approached the Washington wine selection. I think you have to have wines from the region where you are. In San Francisco, we have a lot of old California wines. But we’re still sticking with the same idea of balance, the same idea of purity, the same idea of artisanal wines, the same idea of wines that matter, wines which have a story, wines which have people behind them. We live in a commercial world and that’s fine, but RN74 is so personal. It’s dedicated to the farmer - what the French call the vigneron - who have dedicated their lives to growing grapes. So the idea must be transformed from the Burgundy idea to Washington or California and it must also come down to the kitchen, the food we buy, the product we buy, the spirits we sell. Everything has the same idea. The model is, not to say we don’t like the big producer, but our focus here is on the small guys, the Gramercys of the world, the Cadences of the world - people who care about balance and people who care about integrity and really the purity of the wine. It could be any region. It could be the Loire. It could be Oregon. It could be Washington or California. That’s the whole idea of RN74. This is a wine restaurant. It’s very hard to tell a chef we’re going to open a wine restaurant. ‘It’s not going to be about the food; it’s going to be about the wine.’ Most chefs would say, ‘Forget it. It’s not going to happen.’ If you look around in the whole country, how many wine restaurants are there? There are very good restaurants which have great wine programs. But a restaurant where the center is wine? That is every sommelier’s dream. You’ve obviously tried wines from all over the world. What’s your impression of Washington as a region. Where do you see it fitting into the world or what makes it unique? I think it’s very unique. It’s not easy growing grapes here compared to California. I think that while they are still figuring out the correct grapes to plant in the correct places, they are figuring it out. The Syrah is amazing. I think white varieties are going to shine more in the years to come, Riesling, even Gruner, Semillon. They are all very, very interesting and very unique. We know that Syrah works in The Rocks. I think Cab Franc is something to watch out for. That’s something I’ve been very impressed with in the lighter Chinon style and in the Bordeaux style. I’ve been to Walla Walla and what I like is that there is togetherness there. So many regions they don’t have togetherness. They don’t have any synergy between the growers, the winemakers, and who’s selling it. And I see that in Washington. You talked about Syrah, what do you see in Washington Syrah in terms of distinctiveness or where it fits in the world? In Washington, there’s Syrah from The Rocks and Syrah from everywhere else. And they are two different styles. Syrah in The Rocks, I’ve mistaken those wines for Cote Rotie myself many times. If you look at the soil, it’s crazy! But that’s one style, which is at par with a Crozes-Hermitage and in some cases up in the Cote Rotie level. Then you have the rest of Washington, and those are much more like a Hermitage style and much more dense and concentrated. Syrah is very tricky. I’ve made Syrah for a number of years. For a Bordeaux blend producer making Syrah, they make Syrah very different than someone who is making Pinot. Syrah has to be made in a distinct way. You can’t treat it like you are making Cabernet. It’s more in the Pinot style than in the Cabernet style. I love Gramercy Syrah. That’s as good a Syrah as you get in the New World. He (Greg Harrington) did a small cuvee for us for our restaurant, only for here, so we’re super excited about that. You talked about the importance of having local wines, to what extent has your experience in Seattle and the Washington wines influenced the wines you serve at other restaurants? I’ve been an advocate of Washington for many years. One of the greatest wines I had ever was the ’83 Quilceda Creek. I will never forget that day. I’ve always championed the wines of Washington, Andrew Will, Leonetti. They’ve always been benchmark wines. I love taking them to a blind tasting and everyone thinks Right Bank Bordeaux and next thing you know, it’s Washington! Now there are so many new producers I can’t even keep up. It’s amazing to see what’s happening. Switching gears, wine can obviously be very intimidating, what do you try to do as a sommelier to make wine less intimidating, to make it more accessible? We try and not talk about wine as a brand or a commodity. We try to talk about wine as flavors. Instead of going up to a table and saying, ‘What wine do you want or what grape do you want or what region do you want?’ - that’s too advanced. Instead, you say, ‘What kind of flavors do you want?’ And you go from there. You offer something or give them a taste by the glass and ask if they want something similar to this. It’s all about flavors. We can sit here and talk to our guests for hours about the nuances of wine and the viticulture and whatever but you have to understand what level they are in and go from there. That’s the most difficult thing for the role of sommeliers. Sometimes we might get too ahead of ourselves or our guests and go into this detail. We don’t want to intimidate them. Hence (at RN74) the jeans and the sneakers. It’s all to tone down and be kind of normal and not intimidating. You talked about your experience making wine. How has that changed the way you think about wine? I think for any winemaker they are the biggest critics of their own wines. I am I know. I know the mistakes I’ve made. I know what I should have done or shouldn’t have done. You’re definitely more humbled by the experience. You know in most cases you can’t do anything about it. You can’t change too much. You definitely give wines another shot. I was never too critical of other wines and now I give any wine a second or third chance because you don’t know if maybe it needs air or whatever. It definitely changes the way you think. It’s easy to take a glass of wine and criticize it or talk about it. But it’s a lot harder to make it and some people take that for granted and think it’s easy to make wine. It’s not. You obviously have the opportunity to see a pretty broad perspective with all of the different Michael Mina restaurants. What trends in wine do you see happening right now in terms of what people are interested in? I think Burgundy has reached its absolute peak. The frenzy - it’s almost too much. Pick something else because there’s not enough for the world! I think Bordeaux, that has taken a big dip. I think high acid whites, people are still not fully into Riesling because they think it’s sweet, but I think that’s going to take off very soon, the aromatic wines, the high acid whites. Spanish, northern Italian whites, Austrian, and Greek wines are finally catching on with people. I think it’s an amazing time now to promote wines of the world, wines with a story, not just a product but with a real story behind the people that are making it. That’s the real trend that I’m seeing. People are wanting wines with stories of integrity instead of just wines with names or nice labels and a heavy bottle. People want to know about the wine. They want a story. I completely agree with his comments about Washington Syrahs and Cab Francs. My favorite wines of these varietals come from Washington! Great interview Sean. When I was in Seattle last year, I made it a point to visit RN 74 for the first time. I was very impressed atmosphere, the food and the wine list. I agree that Washington Syrah is really outstanding. It may be a niche grape in the broad market, but look at how many of the $40 and up bottles completely sell out within 6 months of release (small production is certainly a factor). The people in the know get it before it's gone.